Tony’s thoughts: Obviously with the deeds of ORTENSIA I have developed a liking for the Testa Rossa’s. We have had good success outside of her with horses like ROSE SYRAH and HANNA ROSSA. 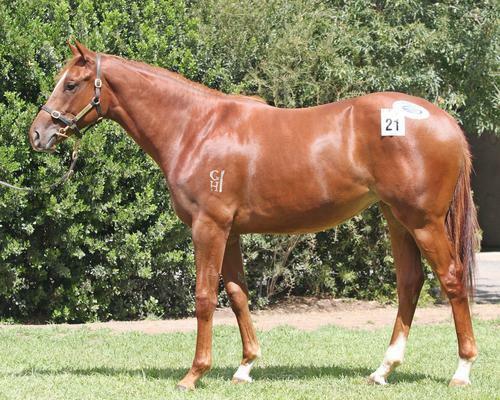 This filly that we purchased at the Magic Millions Adelaide sales for $41,000. She is out of a Woodman mare who has proven to be a good Broodmare sire, the mare herself is a half sister to a stakes winner in BARBARICUS. This filly gives me the impression that she is more of a 3YO type that will get over a bit of ground and Testa Rossa has already thrown a Derby winner in TESTAFIABLE but she does give the impression that she is more a middle distance staying filly. She is a November foal which Gerry Harvey bred and he sells at Magic Millions sales. She wasn’t at the Gold Coast sale as they wanted to give her more time as she was a November foal. She is a lovely balanced filly which is typical of the Testa Rossa’s, she has a good hind quarter and she is not over big she is just a very athletic filly. As I said she gave me the impression that she would be more a 3YO type then a 2YO type that will hopefully get the Oaks distance. I thought that she was good value and she is a lovely filly that I hope would turn into an Oaks filly one day.